I am a big fan of The Pillows. I have seen them live two times. I love their CD's. (All that stuff.) Ever since I saw Sawao's custom Cyclone I have wanted one but I didn't learn about them until long after they were made. 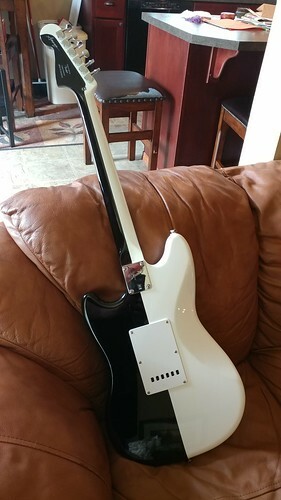 (Only 300 were made... yadda yadda yadda...) I set up a search notifier on eBay and Reverb for "Fender Cyclone" "Squire Cyclone" "Sawao Cyclone" and "Sawao The Pillows" and I check those searches every day. I have been doing this for likely over a year. Maybe even two years. Never seen one.... then I see a post on my Facebook wall from Awstin linking to an eBay auction with one and I quickly checked the pics and picked it up. I am super pumped! I can't believe I finally found one of these! There will be better pics when it arrives, but this is what it looks like. Man the first time I flew to Japan it was pretty scary. I didn't know any Japanese and was alone. I found the FLCL soundtrack (That is pretty much all Pillow's songs) and it got me through that trip and all the way home. Still one of my favorite CD's I have. Love the Pillows. I've listened to everything up they released up to about 2000 (so basically everything FLCL) and it's all pretty great, though their earlier stuff is a bit weird and not at all what they're kinda known for. I love the look of Cyclones and I think this sig is pretty neat. Interesting that they even painted the back of the neck as well. 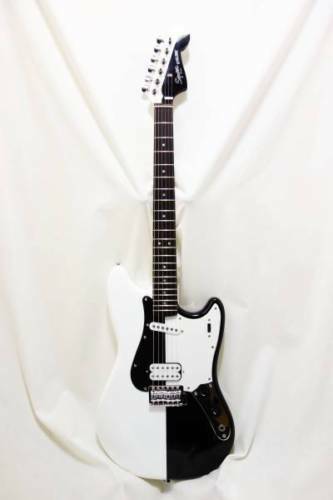 not sure I'd pay 1.2k for it, but nice guitar. The worlds a crazy place, we have one guy can't sell his 64 jag for 3K and we have another guy buying squires for over a grand. I'm more of a MIJ for lifer. 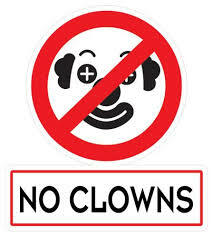 Man, I've not listened to the pillows in ages! 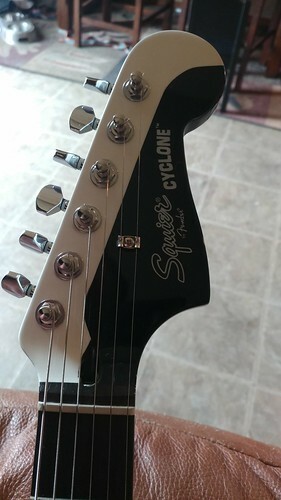 That's a really cool guitar though - I quite like the Cyclone, but I've never found one in a store anywhere. I remember Sago doing a sig model for Yoshiaki Manabe that was being shown at the Japan Expo in Paris back in 2014. I was lucky enough to try it out, and then see the man himself giving a public demo. His signatures are pretty cool looking guitars. 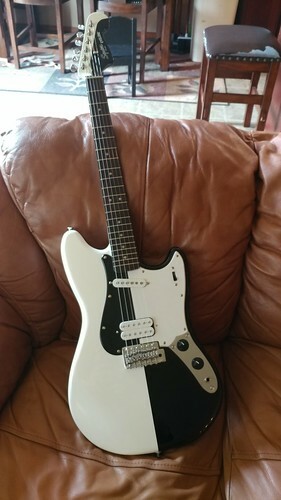 I have a Japanese Mustang the same color as the ones he did a ways back before those guitars. He is a great player. Guitar came in today and is pretty awesome! It is in excellent shape except one neck pocket crack on the white side.... Given how rare these are, I am going to live with it. LOL Here are pictures. I like it a lot, very unique! Love the Pillows but I've never seen this. 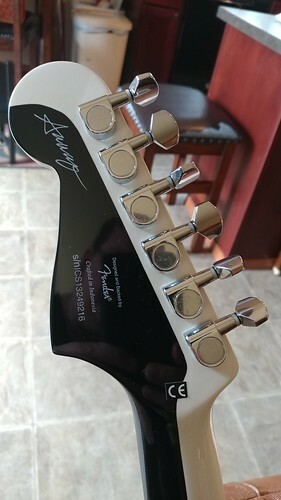 Curious, did this design have any influence on your Jagstang project? 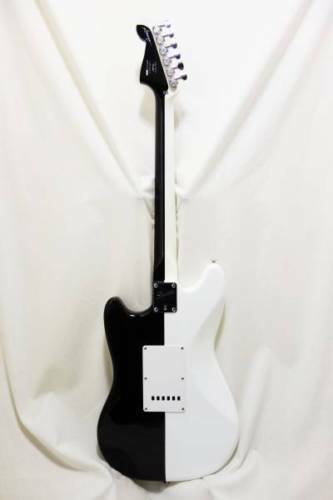 Also is the pickguard painted black on half or is it two glued pieces of plastic? Yup! I based my walnut maple Jag-Stang off his guitar. 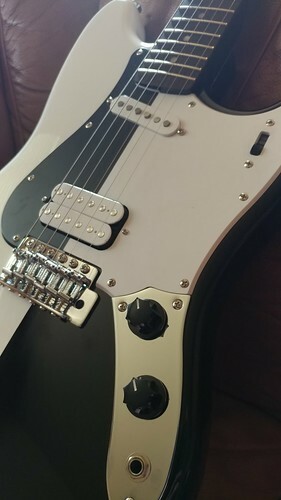 The pickguard is half single ply white and half single ply black. Not sure how they glued it. its the michael schenker flying V paintjob! ridiculous!! i love it! That is a hot V.